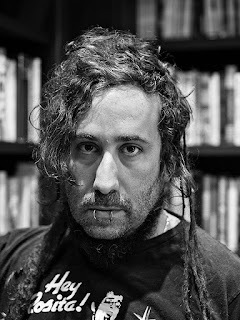 Australian author Bram Presser's new novel creates his grandparents' Holocaust story out of family history, imagination, old photographs, and ephemera. Bram recently answered questions for Rose City Reader about his new book, Holocaust memory, and writing in general. How did you come to write The Book of Dirt? My grandparents never spoke about their Holocaust experiences so, growing up, we constructed comfortable narratives around their survival. A few years after they died, a newspaper article was published claiming that my grandfather had been selected by the Nazis to be the literary curator of Hitler’s Museum of the Extinct Race. I became obsessed by this story, and by the realization of how little I actually knew about a man who I had loved so deeply, so I set off to find out what had actually happened. From there it spiraled out of control in the most intriguing possible way. Your book is called a novel, but reads in part like memoir and uses historical documents. How much is your family’s actual history and how much is fiction? That’s a difficult question to answer. The book is essentially the story of my search to find their stories set against a reimagining of what happened. I’d say the search narrative is almost exactly as I experienced it, except for some minor changes for timescale and the like, plus one major invention to set up the whole dirt part of the book. The reimagining is probably more historically accurate than I had first thought, given that it is built on documents, photos, records and stories I was told. So, it is a dramatization of either what happened, or my best guess based on the evidence. But there is also a strong magical realist thread that weaves its way through the story and that is pure creative license. I am really enamored of Czech and Jewish myth and legend, as well as the fable as a storytelling device, so it was inevitable that they would make a strong showing in whatever I write. Also, I found that writing my family as fictional characters gave me a stronger sense of who they were and how their experiences might have actually felt. There is an essential truth in fiction that I wanted to find that a simple historical excavation could not possibly provide. I came up with it very early on in the process. After reading the newspaper article, I was struck by the idea of my grandfather finding a hollowed-out book with a pile of dirt inside that might have been the golem’s heart. So initially the title was literal. As I dug deeper, travelling the world, collecting whispers, anecdotes, documents, even gossip – a lot of it what we would colloquially call “dirt” – it seemed even more appropriate. Moreover, the golem seemed the perfect metaphor for writing about my grandparents (or anyone you’ve known and loved) – the idea that I was creating them from the clay of evidence and breathing life back into them with words. Who is your intended audience and what do you hope your readers will take away from your book? I hope anyone interested in memory, identity and the way we tell stories will find something in it to engage and challenge them. Although it is set in the context of the Holocaust, I don’t think of it as a Holocaust book. It’s more about how we much we can really know the people we love, and the way in which we recreate their lives every time we think about them. Your use of black and white photographs and ephemera throughout the book remind me of Austerlitz by W. G. Sebald, another novel about the search for family taken to the Theresienstadt concentration camp. Were you inspired by Sebald? Yes and no. My greatest inspiration, stylistically, was the Croatian novelist Daša Drndić who came to be a mentor of sorts through the writing of The Book of Dirt. Sebald is the gold standard for documentary fiction and helped me to understand the use of image and object as a narrative device but Drndić takes it to an almost hyper level in her novel Trieste. Reading that was my lightbulb moment when I realized how this story ought to be told. It’s interesting that you mention Austerlitz, though, because recognizing the similarities in style and the Theresienstadt angle, I actually had to consciously ensure that they weren’t too alike, especially given that we were working from a lot of the same source material. Working on this book, I found myself regularly surprised by what I found. Understanding the camps as more than just death factories, but places where people made lives in horrific circumstances, and built tight, often transient communities was quite inspirational. On a personal level, learning that my great grandmother, Františka (my grandmother’s mother), who I knew when I was a kid – she was a tiny, crumpled old Czech woman – was an incredible hero who risked everything to keep her family alive just blew me away. She was a convert, so she wasn’t taken to the camps, and she did so many incredible things from back in Prague to make sure her daughters survived. I set out to write about my grandfather, but it was Františka that stole my heart and really became the focus of the book. What do you think people today can learn from the stories of Holocaust survivors? Decency, humanity, resilience, courage, the importance of fighting for what is right and nipping intolerance in the bud. The understanding that perfectly functional societies can devolve into murderous dysfunction (or hyper-function), that perfectly ordinary people can do terrible things, that hatred and division can lead to catastrophe. Do you think it is important to keep Holocaust memory alive and why? Absolutely. Ever more so at the moment, where violent division seems to be the political norm across the globe. We’re only seventy-five years on, and so many of what I’d have hoped were the lessons of the Holocaust seem to have been thrown by the wayside. Hatred and scapegoating is being normalized. It feels as if we’re already on the path of the famous “First they came for the socialists…” poem. Now is the time to stand up and fight against the tide of fascist populism. Wow, where to begin? I’d probably give you a different answer every time you asked me, but today I’ll say Franz Kafka, Jesse Ball, JM Coetzee, Magda Szabo and Daša Drndić. I’m not sure how overtly they influence me, but it’s hard not to at least want to write the kind of book you like reading, which will be informed by those authors you love most. Oh, except Drndić. She absolutely influenced me. I tend to mostly read difficult, surreal literary fiction. I like to be challenged, both intellectually and morally, by what I read. I also love books that dare to experiment with form, that try something new, even if it doesn’t necessarily work. Then there’s my predilection for what I call “literary sorbet,” books that I can just devour without thinking too much, just for the fun of it. At the moment I’m reading Rachel Kadish’s The Weight of Ink and Olga Tokarczuk’s Drive Your Plows Over the Bones of the Dead. No book is ever finished, just published. Be prepared to let it go. I have a few books on the go, though haven’t committed to any of them yet as the project. Two are stylistically similar to The Book of Dirt in that they are based around true events and blur the fact/fiction divide. Then I have a linked series of speculative fiction novellas. And a kids’ book. But after spending eight years working on The Book of Dirt I’m mostly enjoying just taking a bit of a break and being a stay-at-home dad to my eighteen-month-old daughter. Just quietly, it’s way better than writing. 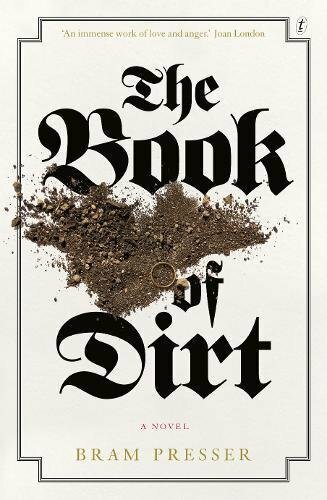 THE BOOK OF DIRT IS AVAILABLE ONLINE, OR ASK YOUR LOCAL BOOK SELLER TO ORDER IT!